Arriving in Canada from countries where they experienced oppression, conflict, violence, and persecution, patients coming to Sanctuary are in need of healing and nurturing support. On April 4, 2013, Sanctuary began in a church library with 6 patients, with a vision to create a welcoming environment where, with the expertise of staff, refugees can heal and fulfill the potential within them. Now, five years later, at its new location at 310 King Street East, Sanctuary cares for 3500 patients and counting! Among them, 67 countries of origin and more than 30 different first languages are represented. 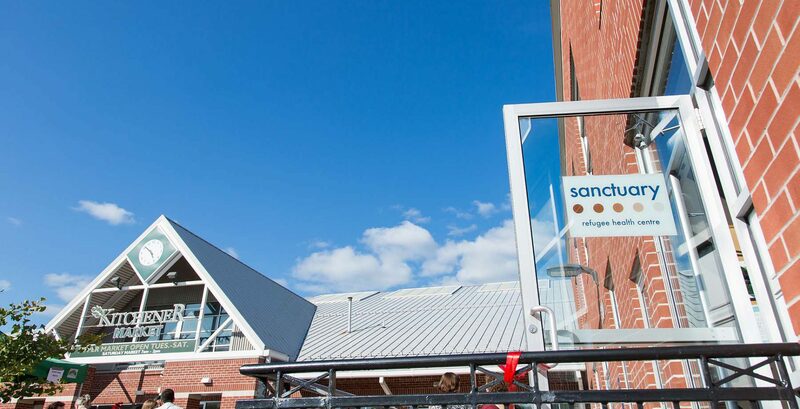 Here at Sanctuary, we provide patient-centred, evidence-based health care, recognizing issues arising from persecution, trauma, migratory stress, and social integration. We seek to bridge cultural and linguistic difference in offering orientation and access to the Canadian health care system. We also work tirelessly with partner organizations to create a ‘hub’ of services for the well-being of refugee newcomers seeking a new life in Waterloo region. At Sanctuary, in addition to culturally sensitive primary health care, patients have access to a wide variety of services on site, including psychological and mental health assessment; trauma counselling; dietary advice; assistance with settlement issues; help in completing applications for income security and disability benefits; health education; and special programs designed to meet needs around childbirth, parenting, and respect for diversity. Sanctuary Refugee Health Centre is an Ontario Not-for-Profit Corporation approved as a charity by the Public Guardian and Trustee (March 2015).